There are days when you travel when the world feels illuminated. Everything is clear, including your head, and you realize you know beautiful and enduring truths. “Tteokgalbi” doesn’t have any rice cake in it. 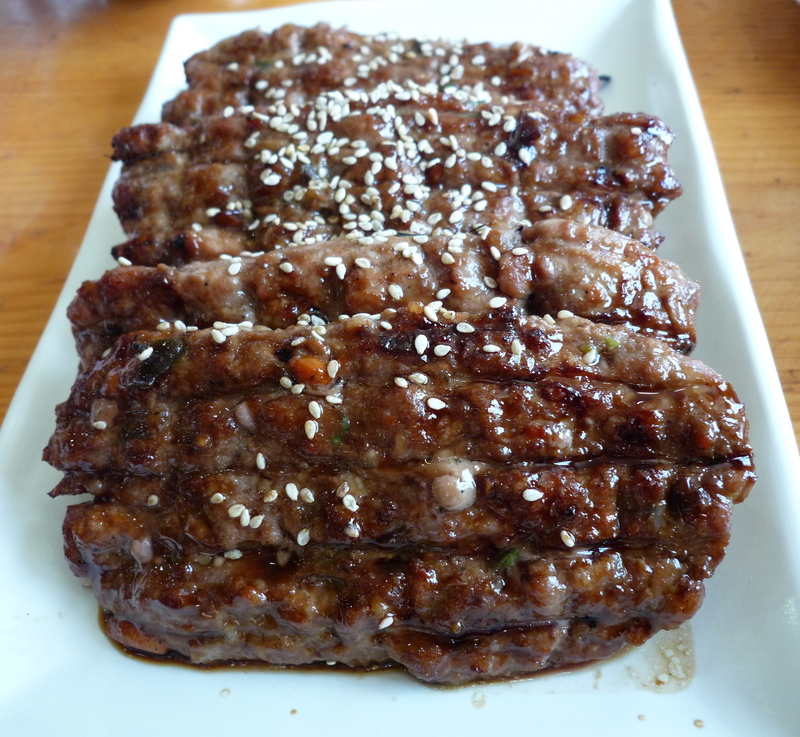 Having only tasted it once in Gwangju, I am not an expert, but it is essentially meat that has been finely chopped and molded into oblong patties that are grilled. Because the meat sticks together and it’s been molded, it’s like “tteok.” Okay, it really isn’t, but that’s my best explanation for why it’s called tteokgalbi. It’s marinated like galbi in a sweetened soy sauce marinade, and looking closely at the version we ate, it is sometimes mixed with diced carrots and other vegetables. It’s basically galbi hamburger. Diane is allergic to pork. So is her father. Such a thing is so shocking to me, I almost can’t believe it, but I am not the one who feels horrible and ill after eating pork. They stopped eating right away, while the rest of us, looking down at our bowls, thought, “How could we have ever thought we were eating beef?” It was clearly pork! When the tteokgalbi arrived, the waitress told us the tteokgalbi included pork as well as beef. 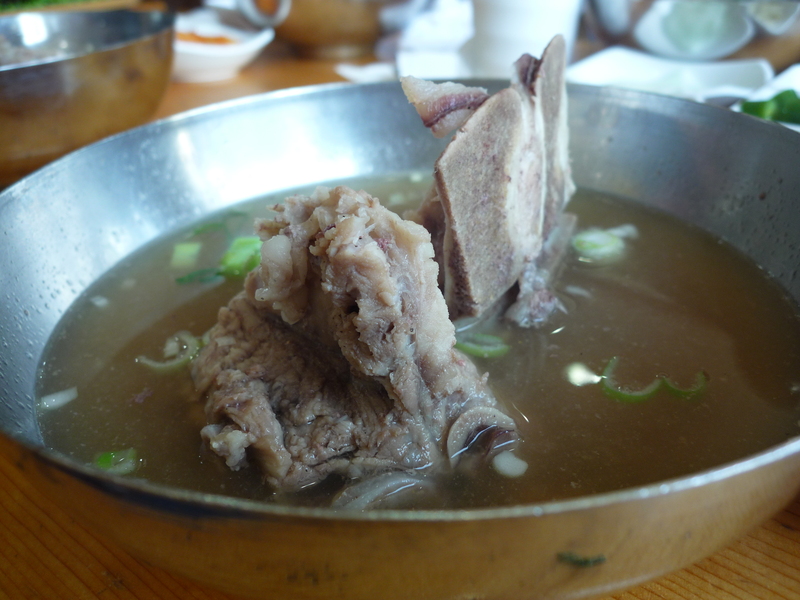 We shouldn’t have been surprised, given that an order of tteokgalbi was only 9,000 won or a little less than $8, which would be impossible for an all beef rib dish. Diane and her father didn’t eat any, but the rest of us scarfed it up. It was tender and moist, the way good pork-beef meatballs are, and the marinade hadn’t been laid on with too heavy a hand. It wasn’t quite like hamburger; it was still firm and didn’t give too much when you chewed on it. The banchan or side dishes were simple, leaning a little too sweet and too Seoul-in-the-80’s, but there were plenty of fresh vegetables to wrap around tteokgalbi into ssam or wraps. I don’t know what I thought we’d find. 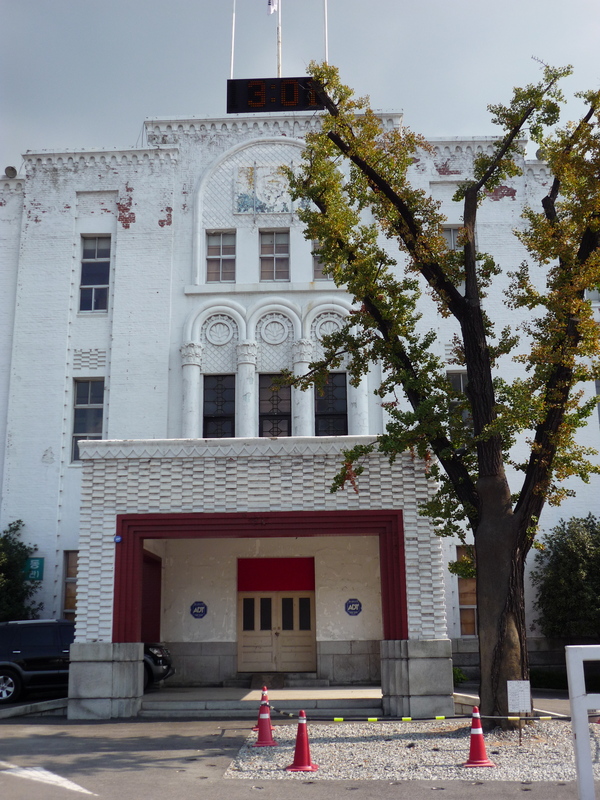 In addition to eating Gwangju’s culinary specialty, we stopped at the former Jeonnam Provincial Office, where some of the heaviest casualties occurred. It dates from the Japanese Occupation, which means it’s crumbly and old and would have been torn down long ago as a symbol of Japanese oppression if it had not become a regionally cherished symbol of democratic opposition. In 1988, the Gwangju Massacre was officially renamed the Gwangju Democratization Movement by the Korean National Assembly, and it’s unquestionable that it was a pivotal and important moment in South Korea’s movement towards democracy. The country ended up prosecuting the politicians involved, even sentencing former presidents Chun Doo-whan and Roh Tae-Woo to life in prison, though they were eventually pardoned. But the country hasn’t really moved on. I don’t know what schoolchildren are taught, but according to our parents, Koreans haven’t really agreed on a founding mythology that allows them to think about what happened in Gwangju as neatly as Americans view the Boston Tea Party. People from Jeollado are sure who the heroes and the villains are. The people outside Jeollado are not so sure. Even before the Gwangju Massacre, Jeollado had a complicated place in Korean history. Exiles from the royal court were sent there. Rebellions were born there, as well as famous dissidents, including the late President Kim Dae-Jung, who was himself arrested for instigating the protests at Gwangju (and kidnapped and exiled) before being elected president years later. 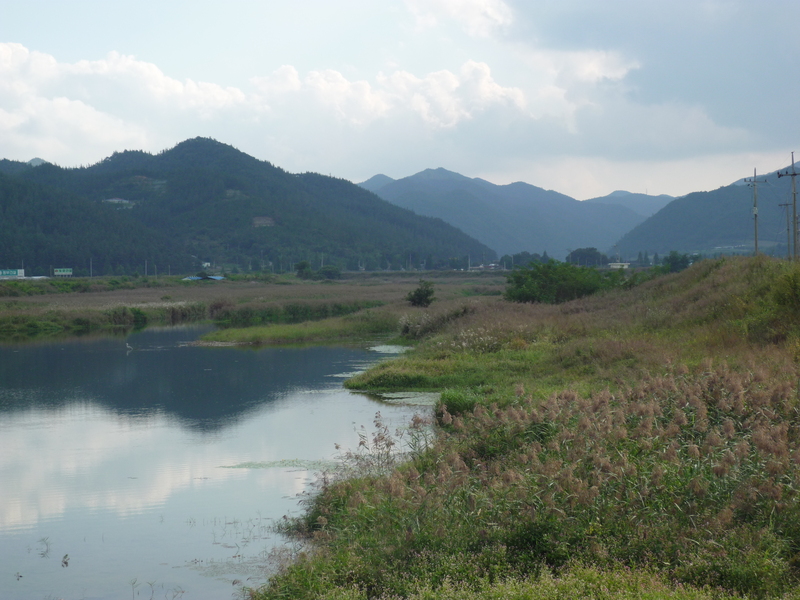 For years, Jeollado saw little development money as political power was centered in other parts of the country, which fed feelings of resentment and oppression. In turn, Koreans outside of Jeollado regarded the region’s people with distrust and suspicion. It was not uncommon to hear people say, “Be careful marrying someone from Jeollado.” It wasn’t a joke. My friend’s parents waited ten years before her maternal grandparents finally allowed their daughter to marry a man from Jeollado. We could have visited at the Memorial Cemetery, but we didn’t. I could tell no one else really wanted to stay in that city any longer, and what would we have found in another hour or two? 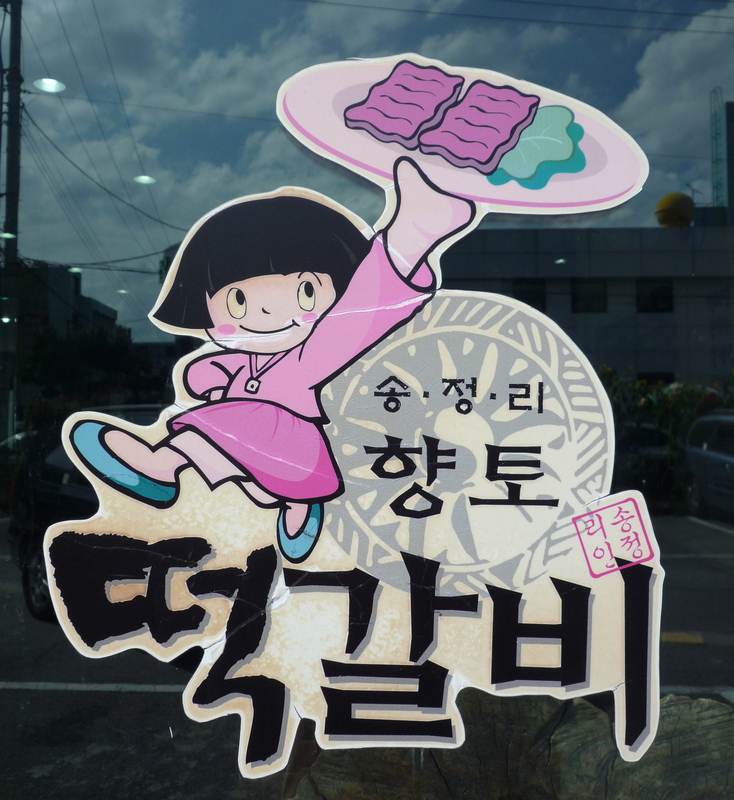 There were no truths, no real connections to be made between Jeollado’s complicated history and its incredible food or Gwangju’s sad past and its alley of mystery meat. The city had looked tired and dingy, with architecture built purely and only for function, and we’d had food that was only slightly more inspired. 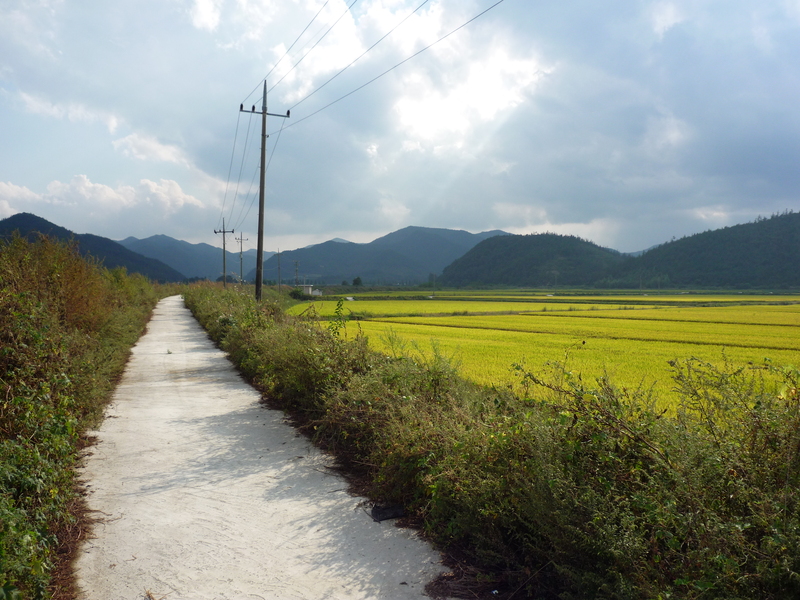 But less than an hour south of the city, we found ourselves in the middle of the most beautiful rice fields I’d ever seen.